Home Lifestyle	How Safe is Your Neighborhood? When I bought my home in 2006, I knew I would be moving into what outsiders might consider a “bad” neighborhood. Personally, I prefer the term “transitional”. I like words. I think words mean something and everything can be spun in a positive or a negative light. Our transitional neighborhood boasts a really eclectic mix of people from the elderly, to young families, young couples with no children to middle-aged couples raising their grandchildren. We are diverse in every way, ethnicity, income, age, and stage of life, but it works. A mile from here, you can find Section 8 housing. A mile from there, homes sell for half a million dollars. So what is this perception we have of “safety”? Does your location really matter when we are talking about random acts of violence and theft? 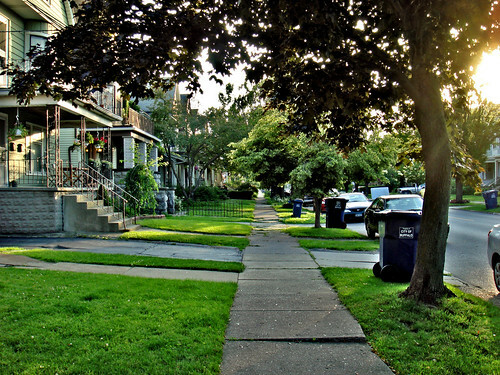 Is choosing to live in a transitional neighborhood unwise? Or is there the possibility that becoming a homeowner and bringing pride of home-ownership to the table would help revitalize the existing residents? Obviously, my personal bias is for the latter. But I bought my home as an investment. Not just financially, but geographically as well. I believe my neighborhood is a quality investment for the area and in the 4 years I have been here I have already seen much improvement. I feel safe here. There may be people who don’t. What I want to know is, what makes a safe neighborhood safe? And what are we doing about the ones that aren’t safe? As I mentioned in my comments about our local School Board changes, I believe the only way to see the change is to be the change. Of course that is nothing new (thank you Ghandi) but it bears repeating. I have to admit that I don’t have a lot of diversity in my life apart from my neighborhood. I stay at home with Oscar, I attend a church primarily made up of other young white people and while I fight it, my heart is full of prejudice based on any number of reasons from my lifetime. In deciding to move into this neighborhood before I was married and before I had any children, I wanted to be the change. I felt that I was meant to be in this home for this season and I needed to learn from the people around me. And I have learned SO much. Now that we have a (hopefully) growing family we are of course faced with the question of safety, but at the same time see the value in bringing Oscar up in an area rich with culture and diversity. I don’t know that I would ever let him do the things I did as a child, no matter what area we live in. It is just a different world now. With that in mind, I am perfectly comfortable staying right where we are. As Americans, we love our safety and we take it seriously. We are armed and protected and safeguarded from every side. But is that the most important issue? How safe is your neighborhood? How would you feel about living in a transitional area? Do we focus on the issue of safety so much that it is detrimental to our own personal growth? Hmm. My comment vanished! I'll try again. It seems that most violence happens within the home, so I don't see a transitional neighborhood as increasing the risk of violence. If anything, you are less of a target of home robbery. We love our neighborhood and being white and a minority has done wonders for challenging my assumptions and insecurities. Weird about the comment! I am starting to wonder about this system…and yeah I agree that I have been really challenged in my mindset in awesome ways being here. It's one thing to say you believe things, it's quite another to live them out. Very humbling. I have lived in a place that was very transitional and loved it. It was and still is a very up and coming neighborhood in Los Angeles. A place where there was a drive by shooting across the street from where I lived, cars broken into, police helicopters circulating most nights. A place where all the hipsters live, where there's never parking available and all the cool bars and restaurants are. I personally never had a bad experience, besides the shooting in mid daylight, but they were blanks. We now live in a very safe planned community that is quite the opposite. My friends from my old neighborhood would never live in an area like this because it's not considered diverse, there's no cool independent coffee shop on every corner, but instead a Starbucks and it's prominently white. I feel very safe here though and didn't feel so safe in my transitional neighborhood. I would never want to raise my child in an area like I had lived before, although many people do. I feel extremely grateful that I live in such a clean, safe area. Two days ago we came back from a walk and I left my $400 BOB stroller out front with my wallet in the back, which included LOTS of cash for the weeks groceries. I totally forgot to put it inside and realized this the next morning when I went downstairs to get my wallet out of the stroller. The stroller wasn't in my garage and I realized I had left it outside and expected it to be gone. It was exactly where I had put it and the wallet was still there with all grocery money in the wallet. This would NEVER have happened in my transitional neighborhood. I could guarantee that. The stroller and wallet would have been history. I think it's great that there are transitional neighborhoods like yours, but I love my safe planned community. I guess you can say I'm living in a bubble, which is fine with me! I think safety comes as much from really being part of your neighborhood (as in, knowing your neighbors and being involved) as it does from the specific neighborhood you live in. My neighborhood is "transitional" in a slightly different way — it's turning over, from one generation to the next. We're also pretty diverse, with a range of ages, incomes and ethnicities — although we're probably still all within a certain range, I like that we've got an interesting mix and I feel generally safe because I know my neighbors and they know me.